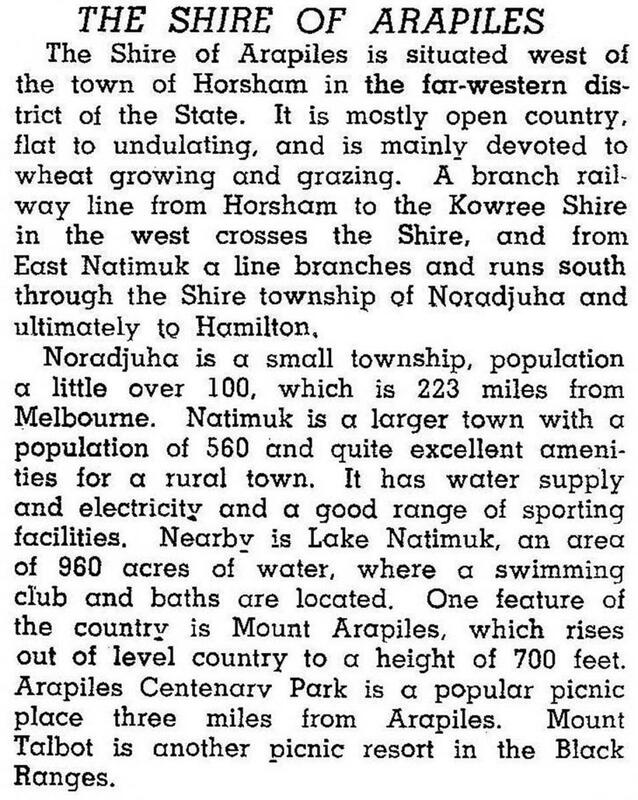 Arapiles Shire (1888-1995) was in the south of the Wimmera region, to the west of Horsham. Its administrative centre was Natimuk, which is 290 km north-west of Melbourne. The shire was named after Mount Arapiles, which was named by the New South Wales surveyor-general, Thomas Mitchell, on 22 July 1836, during his Australia Felix expedition. That day was the 24th anniversary of the battle of Salamanca in Spain, at which Wellington obtained an important victory against French forces. Mitchell had been present at the battle, and the hills and village around which the battle centred were called Arapiles. Mount Arapiles is a prominent outcrop of hard sandstone standing out against the Wimmera plains. It is a world famous rock-climbing location. Arapiles Shire was formed from the severance of the West Riding of Wimmera Shire, at a time when Natimuk and the surrounding district were undergoing closer settlement. The choice of the shire’s administrative centre fell on Noradjuha, a village south of Natimuk and which was connected by railway to Horsham. Council meetings were held in the mechanics institute until a shire hall was built in 1889. A debate over shifting the shire’s headquarters to Natimuk extended over 50 years, ending when the offices were moved by low-loader to Natimuk in 1952. The shire’s territory extended from the foothills of the Grampians at Wartook to the edge of the Little Desert. Mostly it comprised the Wimmera plains, interspersed with lakes, many of which are salty. Lake Natimuk is one of the few with fresh water. The shire’s main centres of settlement were west of Horsham, through Natimuk, and south of Natimuk through Noradjuha. Both were served by railway lines to Goroke and Balmoral respectively, and the lines were disconnected during the 1970s-80s. The southwards area was also traversed by the Henty Highway which passes through Wonwondah. Mount Arapiles is in the Mt Arapiles-Tooan State Park, an area of 51 square kilometres. The park also contains Mitre Rock, a smaller and quite prominent monolith. There are diverse natural vegetation communities in the park. In 1994 farming occupied 69% of the shire’s area of 2343 square kilometres. There were 37,300 sheep and lambs, a few thousand cattle and 274 sq km of cereal crops.